A dull, damp Saturday evening did not deter eight runners from tackling a very testing Wild Night Run, the penultimate race in the Night Run series. This is the Blue Ribband event in the series, with two distances to choose from, a long 10 miles (effectively 11 miles) or a shorter five mile option. With the first half of the race being uphill and conditions underfoot varying from standard mud to deep bog, it would be a tough course in daylight but has the extra challenge of being run in the dark. Starting in South Brent the runners head north to run a clockwise loop with the 5 milers splitting from the longer race just after two miles. In the long race Paul Crease was the first of four runners home, demonstrating that he can be just as quick over this sort of the terrain in the dark as by day. His finishing time of 1.24 secured him 6th place overall and first in his MV40 age category, a superb result for his debut night race. Christine Fritsch was the first of the three ladies to finish, putting in other great run to come home in 2.12. Having completed the five races required to count for the final standings in the series, Christine has finished in third place in her age category. Jo Turner and Ali Holliday ran the race together and, after a three week break from running, Ali was pleased to complete this tough race, finishing alongside her running buddy in 2.46. In the five mile race there was more success for the runners. Gill Spinney, who has done a few of these night races, had a great run coming home in 51.59 for an excellent third lady place. The two men running the shorter routes were both new to these night races, but Mike Westland was clearly not fazed by the dark or the conditions and ran well to come home in 54.19 to be first MV60. Not far behind him was new member Jo Page who crossed the line in 54.56, followed by Jo’s husband, Phil Turner, who had a good first night race, finishing in 59.46. The inclement weather did not stop some adventurous ladies venturing out into the moor for what looks like a splash in the rain. Well done to all the moor runners this weekend. 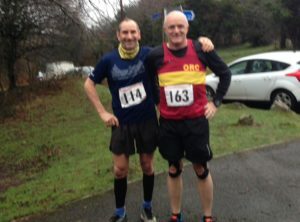 Two runners took on the Plym Trail Marathon series last weekend. Situated within an area of outstanding natural beauty within the Dartmoor National Park, the stunning views of the forests and valleys are breath-taking, taking the runners along the track of an historic railway along the Plym Valley. The course is an out and back one, repeated twice by the marathon runners and once by the half marathoners. Starting in Clearbrook a pretty Dartmoor village, the route takes the runners up the hill through the village in a loop and returns back to the start of the Plym Trail, which is then followed to the outskirts of Plymouth where they turn and head back to the start. With the races held on Saturday and Sunday, Roger Voaden ran a marathon on both days and Robert Richards on Sunday. Roger, a real marathon specialist, ran an outstanding day-one race, settling in second place for most of the race, catching and passing the leader in the last mile to come first in a great time of 3hr 17min. Roger was quoted as saying, “I have never won a race in my life…”. A good recovery ensured he arrived fit and well the next day to run other great race, this time holding second place again, only to be overtaken himself in the last mile to come third in a time of 3hr 26min. However his joint times gave him the overall first place, an amazing achievement and one that the club is very proud of. Robert, on the other hand, was using this marathon as training miles for his Ultra-Marathon in March, but the pressure of racing to deliver a good time got the better of him. After a strong first 20 miles, the steady climb back to Clearbrook proved to be very challenging, however he arrived home in a respectable 4hr 34min and was delighted with the outcome. 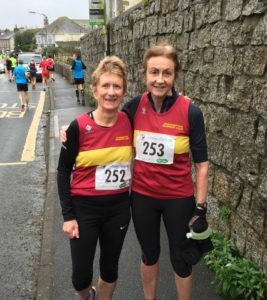 Further afield, Okehampton runners Jane Jackson and Mags Jarvis, made the long trip down the A30 to Camborne to take part in the Storm Force 10 race. This is the first race in the Cornish Grand Prix series and consequently has a very large entry from the Cornish clubs. The forecast had been for weather in keeping with the race’s name, but despite a blustery wind the rain held off with just a fine drizzle to cool the runners. The course is undulating along country roads, with a steep hill at mile four and a long pull at the end up the hill that is run down from the start. Mags ran a well paced race, and was pleased to run a PB over a quite testing course, finishing in 1hr 31mins. to achieve her target of a diamond club award. Still recovering from a bad cough, Jane did not enjoy her race and fell in the last mile, walking in with a marshal’s assistance to finish in 1hr 28mins, still achieving her diamond award however. The Wild Night Run series resumed after its Christmas break with the Moonlight Flit 10k on Saturday evening. Three Club members braved the cold January night to take part in this tough, hilly run across moorland tracks. Luckily the forecast for heavy rain proved incorrect and they came home dry except for their feet. Christine Fritsch was the first home for the club with a really good run to finish in 1.17.24, moving her up into second place in the overall series standings for her age group. The other two, Jo Bradford and Geraldine Walter, ran the race together, finishing in 1.25.35. 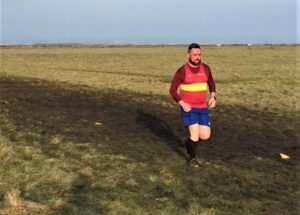 Sunday saw the fourth race in the Westward League cross-country series, this one taking place on the flat and exposed fields of Northam Burrows at Westward Ho! Any expectations that a flat course is an easy one to run are soon dispelled by the water-filled ditches that have to be crossed and the lack of shelter from the wind, no matter what direction it’s from. The weather on Sunday was fairly good for a January day at this venue, but despite the blue skies it was still very cold and very wet underfoot. 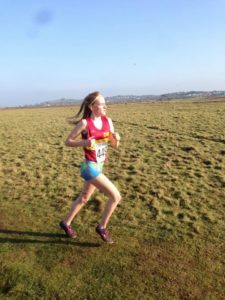 Issy Edworthy was the first to run for the Okehampton in the under 15 girls race where she ran well and didn’t seem too troubled by the going or the ditches. The Senior Ladies Team were next with five runners facing a 5.6k run around an increasingly muddy track. Molly Marvin was, as usual, the first lady home with a great run coming home just one place ahead of her mum, Sarah who is second in her age category overall. Gill Spinney was next, despite having a close inspection of the bottom of one of the ditches and then trying to remove the mud from her eyes and mouth right to the finish! Jane Jackson was next, finishing just three places ahead of Anne Binns. The Ladies Vets are now 6th overall. The mens team were again missing a few good runners due to injuries, but those who made it ran very well despite the track now resembling a bog in places. First home for the club was the on form Paul Crease, who stormed round with an incredible run at an average pace of 5.57 minute miles, securing valuable points for the club, and he is first overall in his age category. 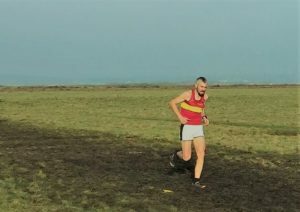 Next was Andy Vallance who looked strong all the way round and was followed by Rob Hicks, whose love of running on the moors meant he was quite at home with the boggy ground but not the lack of hills. Rob Kelly had been tracking Andy Vallance for most of the race and was slowly closing the gap when he pulled a calf muscle near the end, managing to jog the last bit back to make his score count. Paul Carter is second overall in the MV50 category, was next followed by Ed Dumpleton, Stuart Page and Andy Humberstone an amazing second overall in the MV40 category. Roger Voaden got his 2018 marathon campaign off to a good start with a great run at the Gloucester Marathon. There was a new route this year, consisting of four loops with a leg out and back along rural roads, with a surprisingly flat profile for this part of the country. Roger completed in an excellent time of 3.07.00 and is looking forward to the challenge of running marathons on both days next weekend. And finally, thanks so much to Mike Baker for a brilliant moor run on Sunday morning. The conditions couldn’t have been better for a January morning with some stunning views. It was a great route to the summit of Yes Tor (from the Hub) and then back via Meldon Woods, a bit over 10 miles. A lack of actual races over the Christmas and New Year period didn’t stop you all from taking on some tough challenges in winter conditions. On Saturday Jo Turner and Ali Holiday took part in Climb South West’s Dartmoor in a Day. The Winter Traverse is a 50k journey across Dartmoor from South to North in the form of a fully guided walk or run. Starting in South Brent, the route heads north to Princetown and then on to the wilder, more remote parts of the North moors including Roos Tor, Tavy Cleave and Chat Tor, from where the route follows the Rattlebrook dismantled railway before descending to the finish at Meldon. Jo and Ali were using this as part of their training for the Devon Coast to Coast challenge at Easter where they will have to complete this sort of distance for four consecutive days to cover the 117 mile route. After weeks of grey skies, wind and rain, the cold and clear conditions made for some stunning scenery to be appreciated along the way, but the bone chilling temperature combined with a relatively low pace meant the two ORCs felt cold for most of the journey. 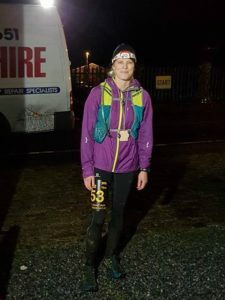 While Jo has completed two ultra marathons before, this was Ali’s first experience of this sort of distance, but supporting each other they completed the tough challenge in 10 hours. 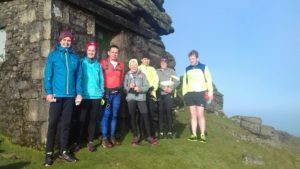 New Year’s Day saw the annual pilgrimage of runners taking on the ascent and descent of Cornwall’s highest hill, Brown Willy on Bodmin Moor. 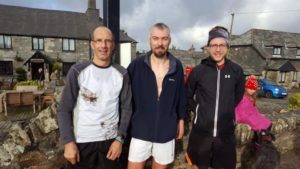 Starting from the Jamaica Inn, the route is a straight up and down type of fell run across open moorland, covering just over seven miles. At this time of year the choice of conditions underfoot is either muddy or frozen and this year it was very muddy! Despite this not being a race, but an informal run to welcome in the New Year, the kudos of being the first to the 1,378ft summit and back is hotly contested by the faster runners. Okehampton’s Paul Crease is a runner who can’t resist a challenge and completed the run in 58.01, to come home in third place. Moor running specialist Rob Hicks also had a good run and finished in 1.01.10, followed by the much improved Chris Turner, who chased Rob all the way to finish in 1.01.33, all three of them being in the top ten finishers. 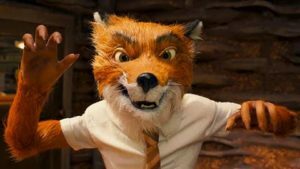 On Boxing Day a lone ORC, Tom Andrew, took part in another charity run that is becoming a traditional fixture of the Christmas period, the Beat the Fox Run. This 5k multi terrain fun run is held in support of North Devon Hospice and starts at the Fox and Hounds pub in Fremington. The “fox” leads the runners out along the road for a short distance, before allowing them to pass him as they head off-road across paths, fields and some very muddy tracks, all the time trying to stay ahead of the fox who, being a fast runner, is hell bent on overtaking as many runners as possible. Tom did indeed beat the fox back, a small reward for running through large amounts of thick mud! Error: Error validating access token: Session has expired on Saturday, 20-Apr-19 03:20:42 PDT. The current time is Monday, 22-Apr-19 10:57:44 PDT.